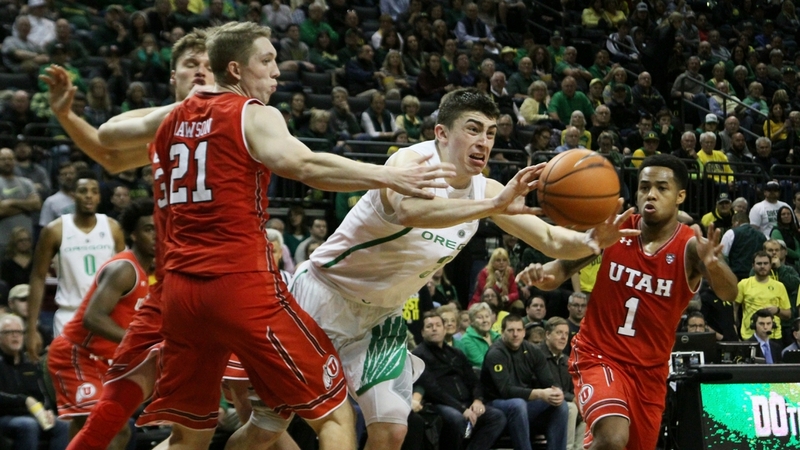 Oregon’s Payton Pritchard (#3) splits the Utah double team on December 29, 2017 at Matthew Knight Arena. For the second night in a row a team challenged Kenny Wooten and for the second time, that team lost. On this night it was Utah who had the audacity to get the ball in the lane in the last seconds against the Ducks’ leading shot blocker. Last night it was Washington State. The result was exactly the same as Oregon advances to the Pac-12 semifinal with an upset victory over the No. 3 seeded Utes 68-66. The Ducks will now play USC, who managed to defeat Oregon State 61-48 earlier in the night. Arizona and UCLA play in the other semifinal game. Utah got the ball with 9.2 seconds left with the Ducks up two. Oregon wanted to deny Justin Bibbins the ball and force someone else beat them. The little point guard torched Oregon for 20 points. It was Sedrick Barefield who had the ball and after he went around a couple of screens, he found a lane open to the hoop. But Wooten was there waiting and even though Barefield tired to go up and under for the potential game-tying basket, Wooten wasn’t having any of it. He pinned the ball against the backboard and eventually in the hand of Payton Pritchard as time expired. Oregon even being within shouting distance of the Utes was a minor miracle as the Ducks struggled shooting the ball from the field and from the free throw line all night long. Utah held a 54-43 lead with 9:57 left. But then Elijah Brown got cooking. The senior transfer from New Mexico picked a good time to get hot from three-point range. He hit a trio of treys in the last seven minutes to bring Oregon to within 54-50 and then 60-57 with 5:08 remaining. Then McIntosh managed to find his stroke from the charity stripe. He struggled in the game with WSU and for much of this night. But the 6-6 post was 5-for-5 in the final 2:30 of the game, including an and-one play with a minute left to give the Ducks the 68-66 lead. Brown led the way with 21 points, all coming from behind the three-point line, shooting 7-of-11 from beyond the arc. McIntosh added 18 points Pritchard scored just nine. Wooten grabbed eight rebounds and that one huge block that was the game-winner. Oregon and the Trojans will be the late game after the Wildcats and Bruins battle it out. USC swept the Ducks in the regular season, but both games were nail-biters. USC won 75-70 in Eugene and then 72-70 decision in Los Angeles Feb. 15. Estimated tip time is at 8:30 pm televised by Fox Sports 1.